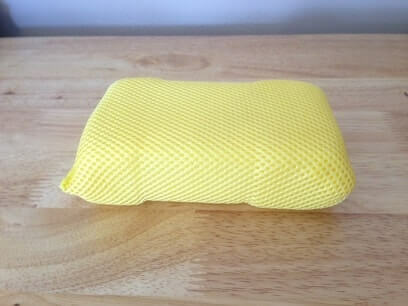 You’ve probably heard of, seen, or used microfiber products. These days they are everywhere. What makes this tiny fiber so special? The answer is a lot more interesting that you think. Take a quick read through this guide to level up your microfiber knowledge! What Makes a Quality Microfiber Towel? What types of Microfiber Towel Exist? Microfiber is a specific type of very fine synthetic textile fiber. Modern microfibers are finer than 1 denier, a unit of measure for fiber that equals 1 gram per 9000 meters of fiber. To better understand that, a strand of silk is roughly 1 denier. Microfiber is finer than silk! Microfiber can be made of several different materials, including polyamide (nylon), polyester, and polypropylene (Prolen). 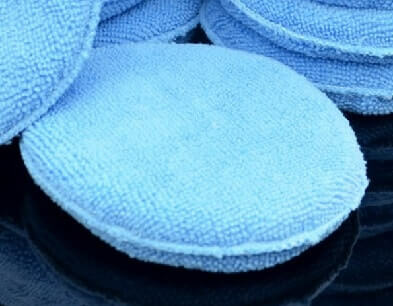 Most common microfiber towels sold for automotive detailing are a combination of polyester and polyamide. The polyester provides the structure of the towel. The introduction of polyamide to the towel increases density and absorption. As you can imagine, manufacturing a product such as this can be quite intricate, explaining the cost increase over that of common cotton terry cloths. Ultra-fine fibers have been produced as far back as the 50’s. Microfiber as we know it has only been around for a short while when the ability to extrude it in a single filament of any desired length was perfected. This extrusion process is the first step in the production of microfiber. 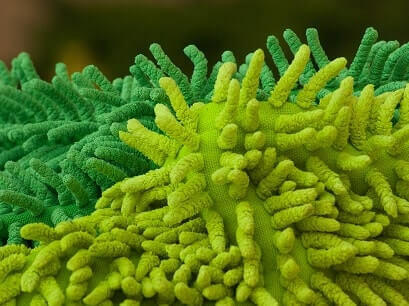 Microfibers destined for cleaning applications are then processed mechanically and chemically to be split into finer parts, as fine as 1/100th the diameter of a human hair. Splitting the fibers not only increases the surface area of the fibers but also creates a positive charge within the fiber. Finally, the fibers are woven in either a flat or looped weave. 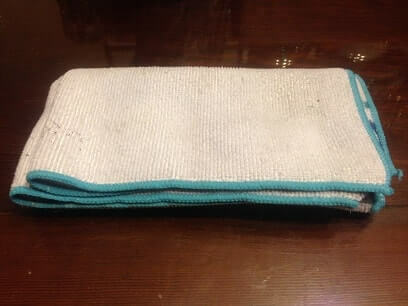 Flat weaved microfiber actually repels water and is not ideal for cleaning or polishing applications. Loop weaved microfiber, on the other hand, contain a web of hook-like claws that can reach into nooks and crannies to remove and absorb dirt and liquids. 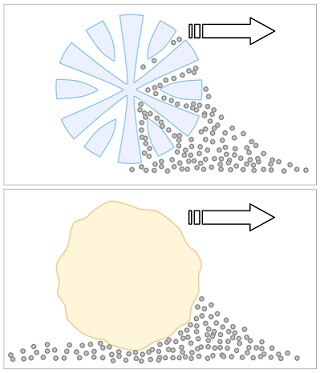 If you were to look at a cross section of a split microfiber you would find that it resembles a start or asterisk (*), differing from a cotton fiber which resembles a circle. This asterisk shape allows microfiber to trap particles, such as dirt and liquid, within the individual fibers. Cotton fibers, in contrast, can only cling to particles around its outer surface and tend to push dirt and liquids around rather than absorb it. As mentioned above, the fibers are also positively charged. The positive charge of the fibers attract negatively charged dirt and liquid which is then absorbed into the split fibers. Due to the physical properties of split microfiber, it can absorb as much as six times its own weight in liquid! It’s also great at retaining polishes and waxes. The positive charge attracts dirt and liquid making it more efficient at absorbing and retaining dirt than the average cotton terry cloth even in the absence of cleaning chemicals. The small size of the fibers means they are able to penetrate smaller cracks and crevices for a deeper clean. Since the fibers are one continuous filament, they are nearly lint free making them safe for sensitive optical surfaces. There are as much as 300,000 strands of fiber per square inch of quality microfiber cloth. This density allows for a very strong and durable towel, durable enough to withstand hundreds of uses and washings. Use and cleaning of microfiber cloths doesn’t cause them to stretch or shrink either so they retain their useful size and absorptive properties for longer. The longer life of microfiber towels means more savings over the long term. 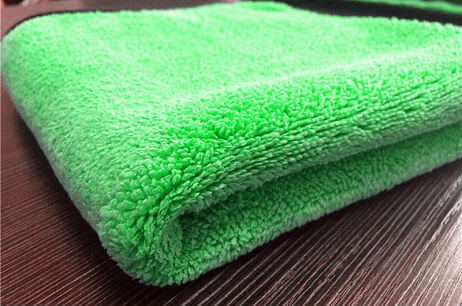 Microfiber towels are typically rated in GSM which stands for grams per square meter or gm/2. This is a measurement of density of the towel but may also be referred to as the weight by some manufacturers and retailers. Do not confuse this with the denier, which is the measure of individual fibers. The higher the GSM the thicker, plushier, and generally softer the towel will be. To put this in perspective, towels in the 200-350 GSM range would be suitable for general cleaning of surfaces not prone to scratches such as hard textured plastic, glass, and leather seats. Towels in the 600-700 GSM range would be more suited to cleaning and drying delicate surfaces such as soft automotive paints and clear plastics. A heavier towel also tends to last longer due to having more fiber contained within. Though heavier towels will certainly cost more, the longer life can make up for it if you plan to use it enough times. A good physical test of density is to hold a towel up to light and stretch it out. Does light pass through? Quality towels will be dense enough to block out most light. You can also weigh different towels of similar size to compare them. If you have two 12”x12” towels and one weighs more it is more dense and possibly of higher quality. Another determination of quality is the blend ratio of polyester to polyamide, usually listed as a fraction such as 70/30 or 80/20. The first number represents the polyester and the second the polyamide. Remember, the polyester provides the structure of the towel. The introduction of polyamide to the towel increases density and absorption. No longer as big of a differentiator as it used to be, due to modern manufacturing processes, both 70/30 and 80/20 towels are near identical in cleaning and absorbing capabilities. The 70/30 blend towels tend to be common to European manufacturers, while the 80/20 blend are common to Asian manufacturer. Polyester is cheaper to produce than polyamide so you’ll occasionally find 100% polyester towels. These towels lack the blend necessary for good cleaning, absorption, and drying. Modern, quality towels will fall within the 70/30 to 80/20 range. There has been a long held belief that fibers produced in Korea were of a higher quality than those produced in China. From my research, this remains generally true. Whether or not this leads to a higher quality towel is much less clear. With advances in modern manufacturing and globalization both China and Korea have a fairly equal capability to produce quality microfiber towels. There are many examples of quality towels originating from both countries. The problem lies in consistency. Production rates in China tend to be much higher which can result in lower quality control. Even though the fiber in a towel may have started in Korea, once it’s transported to China for assembly into a towel, the future of that towel’s quality is unknown. There is also something to be said about the consistency in manufacturing and assembly of a towel in the same factory. When a towel is assembled by the same factory that spun the fabric there is a better probability for a quality product. It’s entirely possible that a towel made completely in a single Chinese factory can be better than one manufactured in Korea and assembled in China. Given this information, I generally look for towels with a consistent manufacturing history and lean toward those with a Korean origin. Quality cleaning towels will be made of split fibers as discussed above. The more split segments per fiber, the more absorptive the towel will be. This measurement is not commonly reported by manufacturers. I have seen reports of around 16 splits per fiber being ideal. Fibers woven in a looped weave rather than flat will be better at absorbing and hanging onto dirt and debris. You can test whether or not a towel is made of closed loop fibers by rubbing it against your skin and feeling how soft it is. If it grabs at the imperfections of your skin this is a sign it’s made of looped fibers. Another test of construction is to try and absorb water with the towel. If the towel does not absorb water well or just flat repels water, it’s likely made of poor quality, non-split, or flat weave fibers. You want to look for a towel with a soft edge. It should either have a rolled edge, a clean cut edge (sometimes referred to edgeless), or an edge covered in a soft material and thread. Rough edges and hard threads can scratch or mar delicate surfaces. This weave is typically for general use in cleaning, polishing, and waxing. 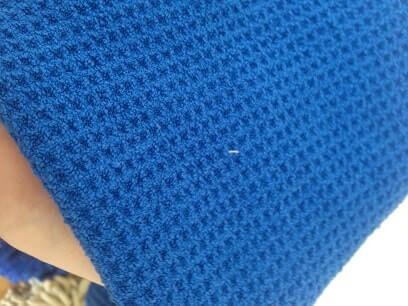 It is identified by the uniform texture across the entire surface of the towel. Excellent at removing dirt and oil from smooth surfaces such as smart phone screens and eye glass lenses. This weave is typically for drying tasks or cleaning tasks that benefit from quick absorption such as glass cleaning. It is identified by a surface texture that resembles the surface of a waffle or waffle iron. This weave is found on wash mitts and sponges. It consists of microfibers woven to form fingers that extend out from the mitt to increase the fabrics ability to hold dirt away from the surface being washed. This reduces scratching and marring of your paint as you agitate the surface to remove stubborn dirt and debris. This is a weave usually found on sponges that is primarily for removing stubborn dirt spots. Do not use this type of sponge as a general all-over wash sponge. Use a product such as Stoners Tarminator to loosen up any stuck on bug guts or asphalt before you scrub. These are the foam filled Microfiber biscuits you typically find at the auto parts stores next to the wax. They are typically covered on all sides with a short nap 250-300 GSM microfiber. 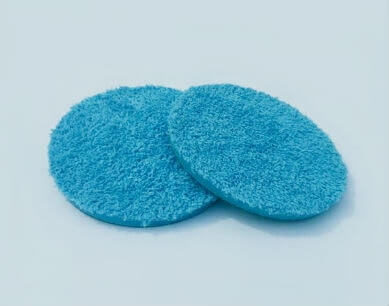 Microfiber pads are meant for machine cutting and polishing. These are not meant for cleaning or working by hand. There is no standard for these pads so you will have to consult the manufacturer’s documentation for which pad to use in what scenario. Read more in my guide The Ultimate Guide to Buffing Pads. 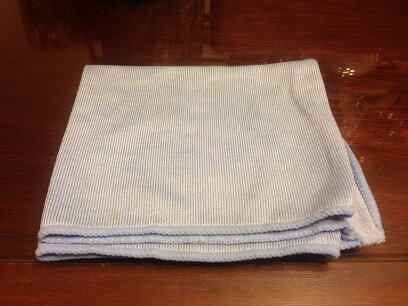 When properly washed, a quality microfiber towel has been reported to last as much as 500 washes. This is a long time and can really extend the towel’s bang for the buck, so follow closely. Always wash new microfiber towels to remove any loose fibers from the manufacturing process. Try to wash different colored new towels, such as red, black, and blue, separately to avoid color bleeding. I also recommend removing the tags prior to the first wash so that any remnants of the tag will wash away. Once you have used your towels, separate them by use before washing to avoid contamination of the compounds that are now trapped in the towel. Washing doesn’t always remove everything from the towel. You don’t want cutting compound on your wax towel or wax on your drying towel. Do not wash your towels with your regular laundry. You will contaminate the towels with lint and other foreign objects. When you wash a microfiber towel be sure use warm water (below 200 degrees Fahrenheit). Cold water won’t break down waxes. I advocate using a strong detergent without any added softeners or any other chemicals. Microfiber is tough stuff and can handle the strong detergents needed to properly clean a used towel. You don’t want to use a dry detergent or a detergent containing softeners because they leave behind residue deep in the split microfibers. Softeners can also reduce and possibly eliminate the positive static charge that makes microfiber so effective. If you want to soften your towels, add a cup of vinegar to the wash load on the wash cycle. It is perfectly safe for the towels. Do not use bleach. It will damage the towels. If your towels contain heavy stains you can pre-soak them in an all-purpose cleaner and gently agitate before washing. Provided your washer supports it, run your towels through an extra rinse cycle to ensure the towels are as clean and detergent free as possible. Once washed, your towels can be machine dried provided you use no or low heat (below 140 degrees Fahrenheit to be specific). Too high of heat will melt the fibers making the towel both less absorbent and more course. Make sure your lint trap is clean before drying the towels to avoid contamination of the towels. Air drying is another option as long as you dry the towels somewhere that they won’t attract dust and dirt. Remember microfiber is positively charged and literally attracts dirt. Once your towels are washed and dried you need to visually inspect them for any chunks of dirt or debris that may remain. Microfiber is so good at hanging onto dirt that sometimes washing isn’t enough. When you find these larger particles simply pluck them from the towel by hand, with tweezers, or by brushing with a small, clean toothbrush. Microfiber products should always be stored in a clean cabinet or container of some sort. This keeps them from attracting dust and other airborne contaminants. Fold your towels and stack them together as soon as they come out of the drier. This is a good opportunity to inspect each towel for imperfections such as loose threads and edge runs. Sort your towels and other microfiber products by type and use. This, again, is to avoid cross contamination. I buy towels of specific colors for specific uses. This allows me to more easily separate them during both use and storage. It also allows me to quickly identify the towel I need so I can save time when cleaning. Keep your towels separate during use as well. 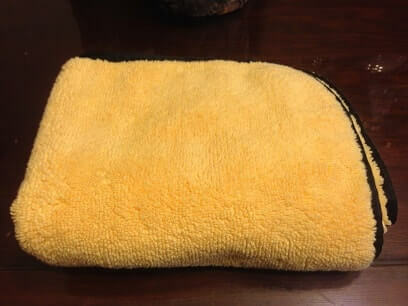 Once a towel is contaminated by dropping it on the ground or accidentally using on a surface it was not intended for, discard it to the wash pile. You don’t want to accidentally return it to duty and find yourself marring your paint. I have a question about using microfiber cloths as a hygiene cloth. I know for my hair and skin I should use the softest. So, from glancing over this article I’ve gathered that I should use a 600-700 GSM split fiber. Would this be the gentlest microfiber? Ironically, my wife and I just went through this same scenario. She had purchased a very expensive gentle makeup removing cloth and when I looked at it it was nothing more than a 600ish gsm split fiber towel at a 4x markup. 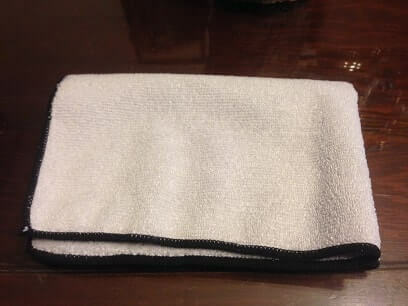 The same type of standard microfiber towel was equally effective and much cheaper. 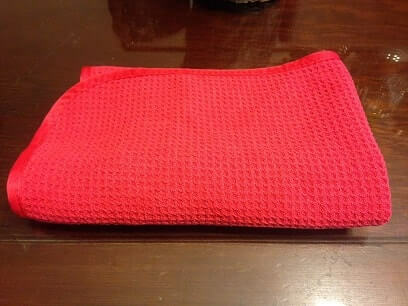 I call the markup on the beauty towel the “pink” tax. So yes, you’d be fine using a plush split fiber towel for your hair and face. Just make sure you wash them first and follow my advice for towel care (tumble dry on low or no heat only so you don’t melt the fibers and reduce it’s softness and absorbency).